Go modern. Get a Cloud Phone System. There are many benefits to using a Cloud hosted, Small Business Phone System. From using advanced touchscreen desk phones, to the freedom of deploying a phone in virtually any location; many small businesses today are enjoying all that a Cloud Hosted Phone System has to offer. Adapt to your Telephony needs. Your business is evolving, so should your telephony. iPBeX can customize your Cloud / Hosted PBX to your unique business telephony needs. You can request or suggest anything from specific calling features, dialing patterns, custom phone arrangements and extension assignments, to entirely new features not listed on our Cloud PBX Features page; all to help break-away from the typical cookie-cutter based design. 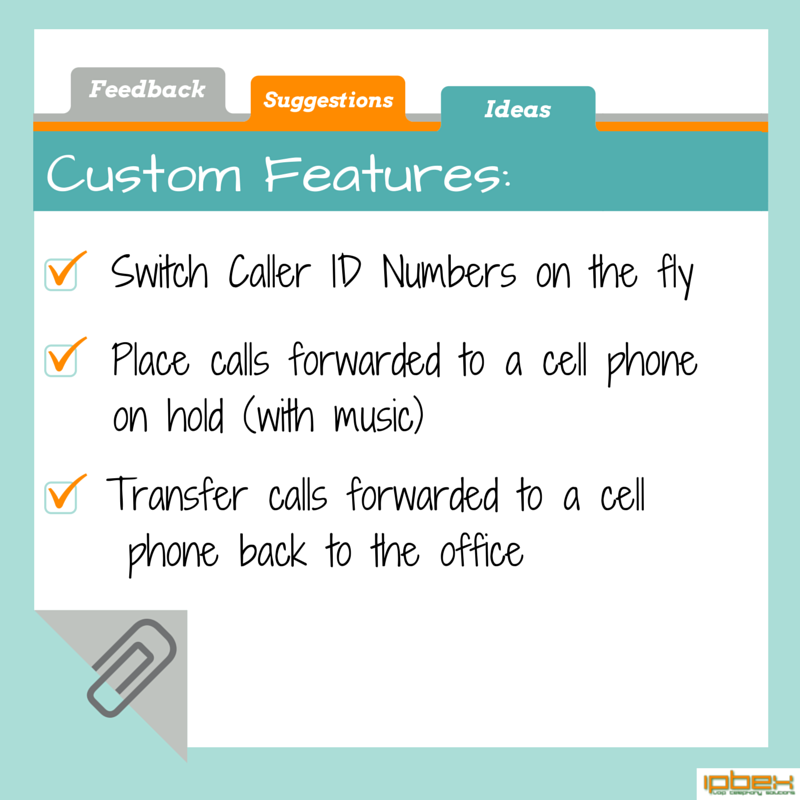 Caller ID Selector - Dynamically select a different Caller ID Number to display on outbound calls, on a per call basis. Remote Transfer - Quickly transfer business calls forwarded to a cell phone back to your Cloud PBX, without hanging up the call. Remote Hold - Place business calls forwarded to your cell phone on hold, with music. Remote Record - Record business calls forwarded to your cell phone. Send the recorded call to an email address or download from the Cloud portal. All remote / mobile features are activated with simple 2-digit feature codes. The above features actually work from any external phone you forward your calls to (ex: a hotel room, or a home phone). Migrating to a Cloud PBX. Worried about having to learn a new phone system, or remembering new feature codes? We can customize almost everything down to your phone extension numbering, extension digit length, voicemail menu options, hunt / ring group settings and more; to clone or closely mimic your existing business phone system for a seamless transition. Phone system features such as, Call Privacy, Call Pickup, Handsfree / Phone Set Paging, and Call Forward are commonly accessed via '*' feature codes such as *72 for Call Forward, or *67 for Call Privacy. Your users will be pleased to know these feature codes aren't changing. We utilize a combination of proprietary and open technologies, fused together through a modular script based design. As an inbound or outbound call is routed through our media nodes, a series of system events are triggered. Any call processing scripts listening for specific events on the event bus and can interact with the call (or do nothing) accordingly. These custom scripts allow our engineers to get very creative in adapting your Cloud / Hosted PBX (and Cloud / Business SMS) to your Business Telephony needs. Ring phones simultaneously with an extended ring cycle for a cell phone, (ex: allows additional time for the cell phone to answer the call). Manipulate the Caller ID Name and Number fields to add or subtract characters (ex: to prepend "Sales" or "Support" to a call arriving on a specific DID number). Forward calls to a cell phone with call confirmation. Unconfirmed calls will revert to your Cloud PBX voicemail. Place outbound calls remotely (via cell phone) through your Cloud PBX showing your main number as the Caller ID. Block callers by Caller ID, rerouting the caller to voicemail or playing a 'not in service' message to the caller.